MoreGoldberg & Weigand, LLP, is a law firm focusing on personal injury cases including motor vehicle accidents, workers' compensation matters, dog bites, slips and falls, medical malpractice and other types of accidents caused by negligence. With combined legal experience of over 40 years, the firm proudly serve the communities of Eastern Massachusetts, including Boston and the SouthShore, Cape Cod and the islands of Martha's Vineyard and Nantucket, as well as the SouthCoast. 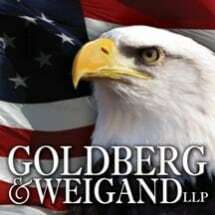 If you have been...Goldberg & Weigand, LLP, is a law firm focusing on personal injury cases including motor vehicle accidents, workers' compensation matters, dog bites, slips and falls, medical malpractice and other types of accidents caused by negligence. With combined legal experience of over 40 years, the firm proudly serve the communities of Eastern Massachusetts, including Boston and the SouthShore, Cape Cod and the islands of Martha's Vineyard and Nantucket, as well as the SouthCoast. If you have been injured in an accident caused by another person's negligence, or if you have been hurt on the job no matter what the cause, you may be entitled to compensation for your losses. There is never a charge for an initial consultation with one of the attorneys. In fact, at Goldberg & Weigand, LLP, there is never a fee for the firm's services until your case is successfully resolved and you receive compensation for your injuries. The attorneys at Goldberg & Weigand, LLP are available to take your calls 24 hours a day, 7 days a week. They will meet with you at a time and place that is convenient to you, whether it be at your home, the hospital, or at one of their three convenient office locations.